In order to celebrate their 50th anniversary, Belgian furniture manufacturer Bulo teamed up with MoMu Fashion Museum in Antwerp (two institutions which have craftsmanship and creativity at their very core) for a joint creative project. At the beginning of the project the following question was asked: ''How can we translate this valuable craftsmanship into the needs of future generations, so that functionality and products remain relevant, innovative and challenging not merely today but also tomorrow?'' 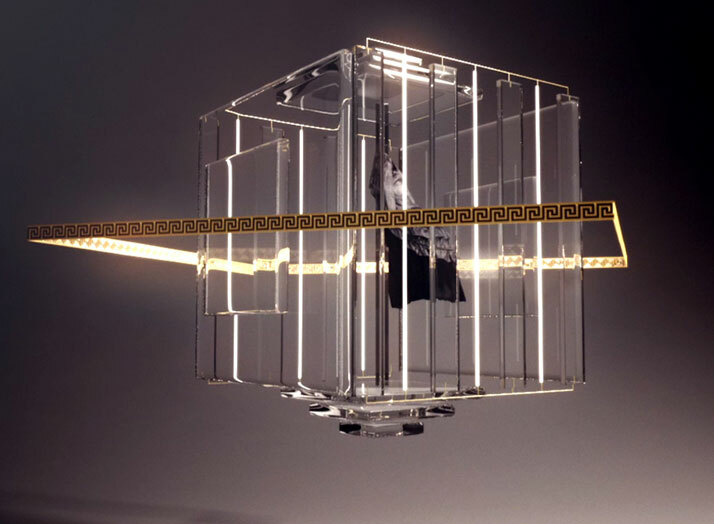 The result is a new video created by Frederik Heyman and Wout Bosschaert which combines advanced 3D technology with select items from MoMu’s fashion collection. Golden Hum, a London-based firm specialising in sound and music production created the thoughtful soundtrack accompanying the video. 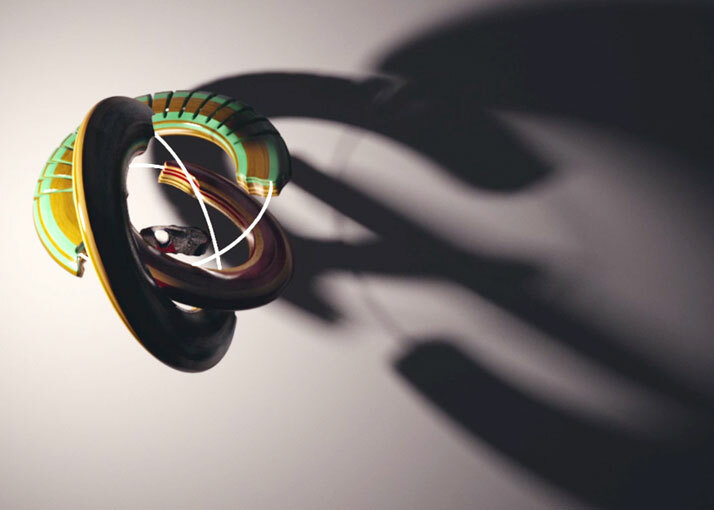 Video screenshot © MOMU x BULO. 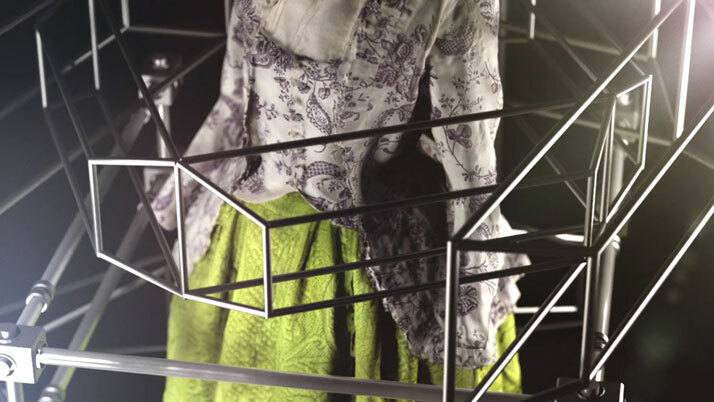 The three parts of the video, titled Motifs, Skirts, and Embroidery, use these three fashion elements as a springboard into exploring functionality and motion. 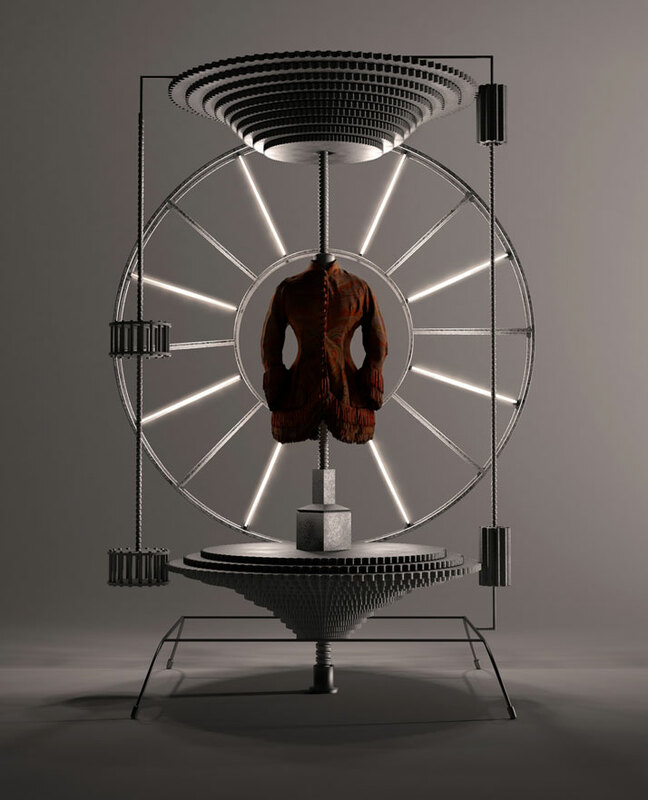 Transcending traditional exhibition settings, the garments are seen hovering within rotating 3D constructions – mechanistic or futuristic capsules that encase the models. The elements used in these rotating machines are predominantly metal, wood, glass and fluorescent lighting; materials which are found in the work furniture designed by Bulo which create a subtle connection between the firm’s aesthetic and that of the MoMu collection. 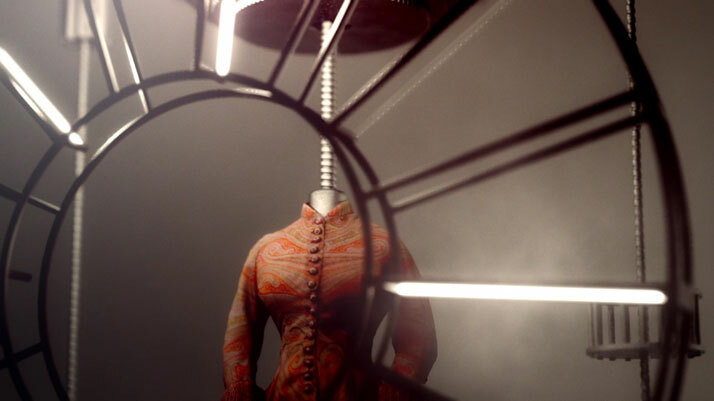 What really stands out in this video however, is the extraordinary feat of creating hyper realistic 3D models of intricate garments (such as the bead-embroidered pieces by Huis Timmermans Lier from the 1920‘s, seen in the Embroidery part of the video). And it is this feat that seems to answer the project’s original question. 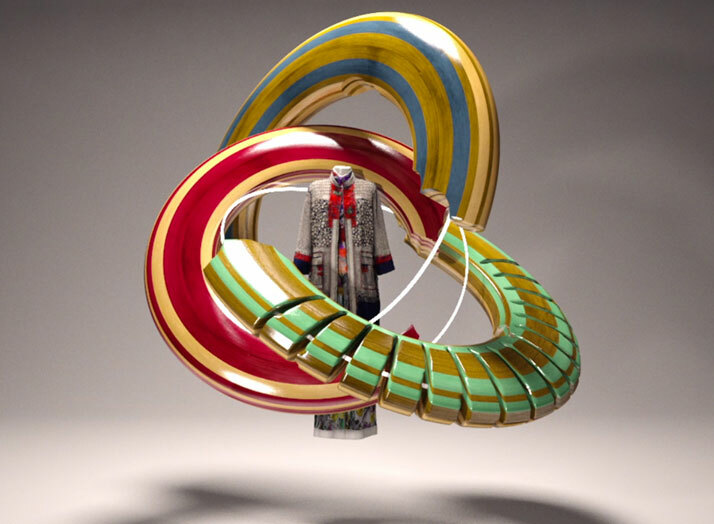 The detailed 3D model of each fashion item has been created in order to become part of the videos’ digital environment proving that 3D-scanning may be an efficient way to document, archive and preserve fashion design for future generations. [YatzerTip]: Even if you missed the presentation of the video during AVOFF6 in Antwerp after its launch at Centre Pompidou from October 11th until 13th 2013, you can still watch it as part of a video installation at Bulo’s headquarters, open to the public free of charge until November 30th 2013. Bulo’s headquarters are located in Mechelen, Belgium, a short drive from Antwerp. MOTIFS: Jacket in woolen jacquard weave with kashmir pattern, decorated with silk trimmings, ca. 1885, MoMu collection T12/108/M27 // Dress and stole in printed organza silk, Christian Dior, ca. 1954, MoMu collection T12/98AB/J204 // Dress in digital printed silk, Peter Pilotto, S/S 2012, MoMu collection T12/820. SKIRTS: Jacket in printed cotton, 1770-1790 and skirt in quilted silk satin, 1750-90, MoMu collection T12/15/B8 and T13/348/B91 // Ensemble with jacket in cotton with silver coating, and skirt in cotton, partly with silver coating, with plastic baleens, decorated with trimmings, Yohji Yamamoto, S/S 2008, MoMu collection T09/1 and T09/2 // Ensemble with jacket in tweed, skirt in a mixture of silk, manmade silk and lurex with crinoline in cotton and plastic baleens, leather stiletto boots and an oversized hat in felt, Walter Van Beirendonck, F/W 2010-11. // EMBROIDERY: Two dresses in silk crêpe decorated with bead embroidery, Huis Timmermans Lier, 1925-27, MoMu collection T86/65 and T86/126 // Dress in crêpe decorated with embroidery in mohair and appliqué embroidery in silk crêpe, Olivier Theyskens for Rochas, F/W 2003-04, MoMu collection T09/674AB // Ensemble with coat in silk decorated with embroidery and bead embroidery, a blouse and pants in printed silk, Dries Van Noten, S/S 2008, MoMu collection T09/48 and T09/50.